What was it like when they first got started? What was it like working in the studio? Adrienne: At first it was kind of nerve racking. I had never done anything like it before, but it was exciting to get in there and finally work in the studio. It took us nine months to prepare the album. It's a perfect blend of hip hop, R&B, and pop. I haven't heard anybody do what we do. I definitely think we're bringing out a new sound in music. Kiely brings more of the hip hop flavor. Naturi's very soulful and I bring a little Latin flavor to the scene. What's the daily process like? Adrienne: We'll get a track and learn a song that's already been demo-ed, which means that someone else is singing it. You learn all the words and harmonies. Then you get in the studio and start with backgrounds. You usually lie down the chorus first. There's something called stacking, which consists of you singing the same thing over and over. Then, they compile all your vocals together. With No More's chorus, it's three of my vocals, three of Kiely's vocals, and three of Naturi's vocals. It's very important to have a good producer. Adrienne: Many artists are signed to production companies that are signed to the record labels. The production company will actually pick out the songs for you, as well as, find producers and writers for you. Sometimes they find producers that allow you to actually write to the track. We only sing songs that we stand for. We're not going to have lyrics that we don't agree with. So, we'll sit down and see how things go with what was selected. Adrienne: I love our first single "No More" because I really think it shows what 3LW is about. When you're singing, you'll look back on feelings that you've had. Maybe you've experienced what the songs talking about. The idea is to get that out through your voice. You want the listener to feel your emotion. What's the traveling situation like? Adrienne: Right now, we're on a radio promo tour. Sometimes you get a little bit jetlag. You do get a chance to catch up on your sleep during those long rides, though. You just have to keep up your attitude. You want to give your best to your fans out there. You don't want to be caught on an off moment. When you get out there on that stage and see you've brought a smile to someone's face, it's such a reward. What are some of the advantages and disadvantages of this profession? Adrienne: You get noticed. No lies, we do get a lot discounts when we go to certain places. Sometimes, when we give an autograph, we'll get 10% off. At the same rate, going places and being recognized can also be a disadvantage. Sometimes you just want to chill with your family. Also, you have to watch your back and make sure you're being a good role model at all times. Kiely: You know a lot of artists have gone years without getting a record deal. You do have to put your best foot forward. You just have to make sure you practice a lot and that you're really on point. The key is to be yourself and do what you do best. Adrienne: It definitely helps if you're a triple threat and can sing, dance, and act. The more you can do, the better. "Now we're three again," says 3LW's Kiely Williams, cuddling up to new member Jessica Benson. "I think that's what we like the most of all. It feels like that's the way it's supposed to be." Benson nods nonchalantly. Next to the always animated Williams and Bailon, the casual newcomer will likely be deemed the quiet one, but her personality is strikingly poised and equally engaging. "One of the things that we loved about her was that she got up [to audition] with so much confidence," says Bailon, who's sporting a shiny platinum "Adrienne" pendant on her necklace. "It's like her whole vibe onstage was like she was already a star, like she had this confidence in who she was and her moves and her whole facial expressions. She was a wonderful performer. I think that was mainly what we saw." Tse Williams, Kiely's sister and 3LW's co-manager, would later call Benson's laidback demeanor a Godsend, joking that she "couldn't handle another one like the other two." Although only 15 (Williams is 16, and Bailon is 19), Benson has been singing for 11 years. She grew up in the Washington, D.C., suburb of Severn, Maryland, a three-hour drive from 3LW's northern New Jersey home base, listening to pop and R&B, including 3LW. It was a D.C. dance club where Benson was turned away from a 3LW audition. The doorman said she had to be 18. "Me and my mom were actually ready to leave, go back to the parking garage, and this lady was running, 'No! Come back! Come back! Come back! We're gonna let you audition,' " Benson recalls. "And I was the only 15-year-old in there, and I finally got to audition and I got to sing 'Neva Get Enuf' off of the A Girl Can Mack album. And I did my thing, you know." Benson had no idea, but Williams and Bailon knew instantly she was the frontrunner. "Because all of the other girls were sitting in the room, you don't want to go, 'She's the one! That's the one right there!,' '' Bailon explains. "So you had to keep the same expression all throughout, but you know inside you could feel like, 'Wow, she was really gonna work out. This girl's dope. We wanna get to know her better and bring her back to New Jersey with us.' So that's what we did a couple of weeks later." The Three Little Women spent a lot of that time singing and dancing together. "One of the most important things about our whole situation was that she is gonna have to interpret our songs until we've recorded new songs together," Williams says. "And she could do that so well, like she had been here for four years like the rest of us." And the choreography? "She caught on quicker than I did," Bailon says. "I was like, 'Wait! Jessica, teach me that part again.' "
Just as important was seeing how well Benson's personality fit into the group. While Naughton painted Williams and Bailon as raging divas when she left 3LW, Benson has discovered nothing of the sort. "They're normal teenagers just like me and my friends at school," she says, her silver hoop earrings framing her round face. "I can talk to them just like I talk to normal teenagers." Benson would prove this to be true after the interview, when she retreated to a bedroom with the other girls. Inside, they sat cross-legged on the floor and chatted, presumably about one of Williams and Bailon's favorite topics — boys. Surrounding the trio in the room were three beds. One might think the stars of a girl group often compared to Destiny's Child would have their own accommodations, but 3LW like to stay close, which makes what happened with Naughton all the more difficult for Williams and Bailon to comprehend. Weeks before she filed a lawsuit saying they encouraged her to sleep with rappers they wanted to tour with, Naughton was sharing a bedroom with them. 2LW, as the media playfully referred to Williams and Bailon at the time, spoke assertively about moving on with the group after Naughton's departure, but deep down they were worried. "After she left, Adrienne and I were sitting there thinking, do we really want to go on as 3LW?" Williams recalls. "She dented the entire integrity of our group." "It was a bad demonstration of what girls of color act like," Bailon says. " 'Oh, we hate each other because oh, you're darker than me or you're lighter than me,' you know." "That's all people need to hear, some black people throwing fried chicken at each other," Williams adds, referring to the now notorious final meeting with Naughton. Williams and Bailon, who say the real reason Naughton left was because she missed her boyfriend back home ("And we weren't interested in having a fourth member of our group," Williams explains), ultimately chose to forge ahead and focus on their original mission. "It's still about representing girls of color," Williams says. "It's still about showing that teen girls can come together." 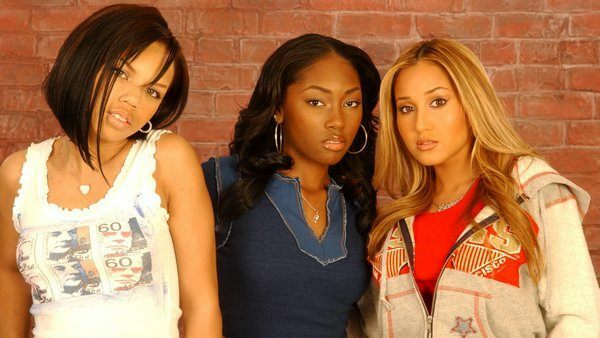 3LW's focus on race raises some interesting questions about their audition process, which included "American Idol"-like tryouts in several cities late last year. "We had Chinese, we had Indian, we had Native American, white people, black people, people from all over," she continues. "We were like, 'Wow!' It was incredible to see all these people who got it, who got what 3LW was standing for." Bailon notes, however, that they were looking for someone of a different color than her or Williams and suggests another dark-skin black girl was their preference. "When people say, 'You have another brown girl,' Well, that was definitely something we kept our eye open for because that's something we are not. There's a group of people who need to be represented in a group like this, and that was the original plan for the group was to have the Puerto Rican chick, or the Latina chick, which was me. Kiely definitely represents for a lot of black girls out there who look similar to Kiely, and then definitely, you know, an urban girl, like our chick here, J. ... I think that was important, that's what we were looking for and we found it." It's almost noon now and as Nelly famously rapped, it's gettin' hot in here. The spotlights have had a furnace effect on the apartment. "I'm always hot and sweating," Bailon says, fanning her face with her hand. "I'm the new Whitney." She's joking, of course. Not that Houston isn't a role model for the young singer, but Bailon and company are playing a different game. With 3LW back at three, they're looking to be the new Destiny's Child, the new TLC. "[Benson] brings a lot to this group — a lot of energy, a lot of attitude, a lot of flavor," Williams says with optimism in her voice. "It's what we were missing in the group all along, and I think that's what we're very grateful to her about."